Dogs….puppies…who doesn’t love them?? These precious animals are automatically adorable, but what warms the heart even more is seeing a dog/puppy in need of help due to some form of handicap (I can almost tear up just thinking about it). Our dogs (whether they are part of a single family home or a single parent home) are one of the most essential parts of our lives and families-loving them like they were our own children. Watching them in pain is the last thing we would want to see and naturally, we here at ReviewCart would like to aid them in the best way possible. Your dog can be suffering from various injuries related to the knee (from jumping fences for example) and let’s be real with this, with dogs doing activities such as this, they can sometimes need just as much assistance as us humans (whether it’s from an injury, just playing around, or a condition that your dog was born with) and it is for this reason that we will review the top knee braces for dogs, for those out there who have a loved one (because doggies are loved ones) who just made need an extra bit of assistance. Dog knee braces are also a great (and less expensive) alternative to surgery which is immediately a huge plus for some of us. And even if you did have to resort to surgery for your best friend, a knee brace can also significantly aid in the healing process as well. Below the top five leg knee braces for dogs will be reviewed, outlining prices, features, pros and cons. Let’s go and ahead and get started! 0.0.1 Below the top five leg knee braces for dogs will be reviewed, outlining prices, features, pros and cons. Let’s go and ahead and get started! This is one of the less expensive knee braces for dogs on the market, costing only 10 bucks on Amazon, for a small and only going up a couple of extra bucks for an extra large (and possibly cheaper if you are an Amazon Prime member). This canine sleeve is ideal for a torn ACL/CCL (which is the anterior or cranial cruciate ligament) and also aids in any kind of strain of the canine knee. 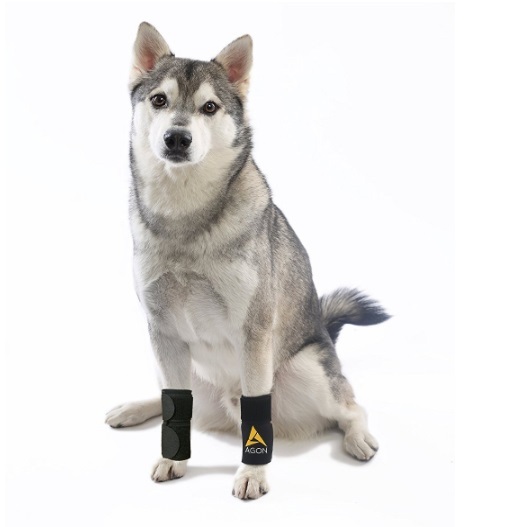 A dog compression sleeve is also a good option for arthritis, as well as for support after surgery (it can aid with stabilization of the knee). The dimensions of this particular sleeve are as follows: Size S – 4″-5″, Size M – 5″-6″, Size L – 6″-7″, Size XL – 7″-8″ (measure circumference is 3″ above the tip of the paw). The price is extremely reasonable so you will not have to worry about breaking your wallet’s heart with this purchase. This sleeve is also made of high-quality material which makes it pretty durable and able to handle any activity that your dog may do during their healing process. It also stays on well which is one less headache that you do not have to worry about. An added benefit to this sleeve could be a Velcro closure which would be a major help since depending on how big your dog is, or isn’t, you may have some issues with the sleeve fitting properly. The sleeve has to be snug enough to offer support but loose enough that it doesn’t slip off with every step. The MyProSupports compression sleeve fits to most breeds including Labrador Retriever, German Shepherd Dog, Beagle, Golden Retriever, Yorkshire Terrier, Bulldog, Boxer, Poodle, Dachshund, Rottweiler, Shih Tzu, Miniature Schnauzer, Doberman Pinscher, Chihuahua, German Shorthaired Pointer, Siberian Husky, Pomeranian, French Bulldog, Great Dane, Shetland Sheepdog, Cavalier King Charles Spaniel, Boston Terrier, Maltese Dog, Australian Shepherd, Pembroke Welsh Corgi, Pug Cocker Spaniel, English Mastiff, English Springer, Spaniel, and French Brittany; you can also rest easy knowing that it will fit comfortably to your loved one. Although many have raved about the perfect fit of this sleeve, there has also been some complaints that the measurements are off and does not fit correctly on their dog’s leg (either too tight or not tight enough). The Canine Knee brace is ideal for a number of knee injuries such as arthritis and joint injuries, (however it is NOT meant for severe ligament tears (i.e. ACL Brace for Dogs). 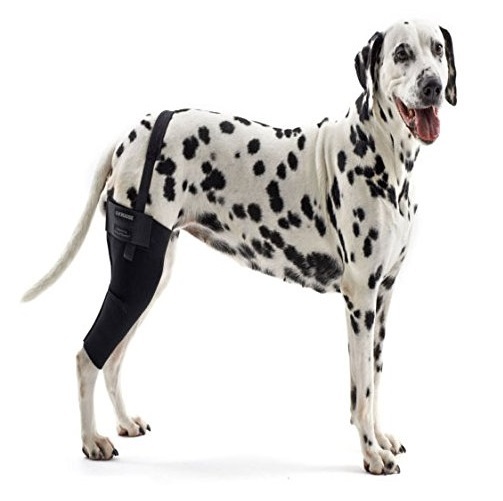 It creates automatic stability in the joint and tendons, dog owners can also purchase a chest harness for this particular model which increases stability and security of the brace. Perfect for a significant number of injuries and joint dislocations; comes in varying sizes so finding the perfect fit for your pooch should not be an issue. The Canine Brace also fits a wide range of breeds from terriers to beagles. This particular brace only will cost you about $40 on Amazon and although it is not the cheapest brace on the market, it certainly will not break the bank. There is a strap that goes around the stomach of the dog for added security; however this may not be a good choice for mail dogs as it could injure “sensitive” parts. The strap that comes with this brace has also broken off only after a short period of time. The AGON Canine front paw brace costs about $30 on Amazon and comes in a pair; the AGON is ideal for helping your dog to heal properly from pain due to injury or surgery, while providing both support and stabilization during injuries. The AGON also aids in inflammation and reduces the possibility of future injuries. When dogs injure one leg, the other leg typically also gets injured shortly after due to the imbalance that is caused by the injury in the one leg. 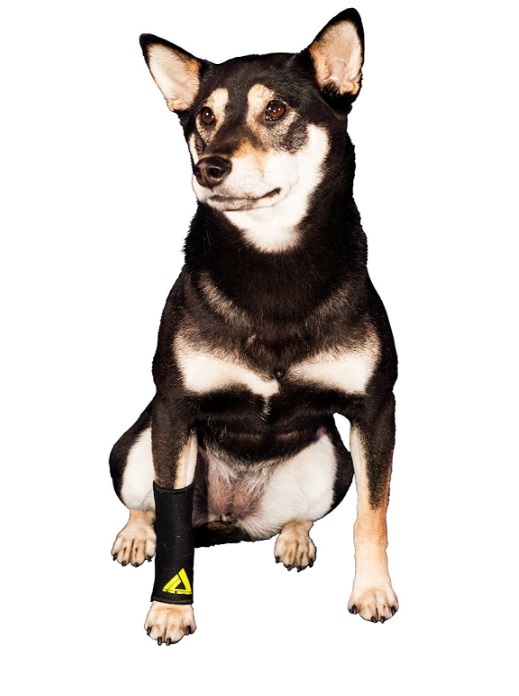 The AGON Dog Brace makes sure that the balance of the body is maintained, so your dog doesn’t get into any more injuries of the knee or joints. Depending on what kind of dog you have and how big it is, the sizes will obviously vary; AGON sizes are either small/medium or large/extra-large. The AGON Dog Brace is made of a smooth mesh sheet that makes it both easy to wear and comfortable for your dog without hurting or digging into the skin. The nylon material is robust and flexible at the same time and incredibly easy to wash. There are also stomach straps that come with this particular brace for added security. Fits weird or some breeds (i.e. Boxers); the brace will bunch up a bit resulting in your dog having some trouble walking or running. The KRUUSE Rehab Knee Protector for dogs will help your dog with both lameness and joint pain in order to significantly improve their quality of life. The Kruuse brace is incredibly elastic for a stabilizing, and secure, effect. 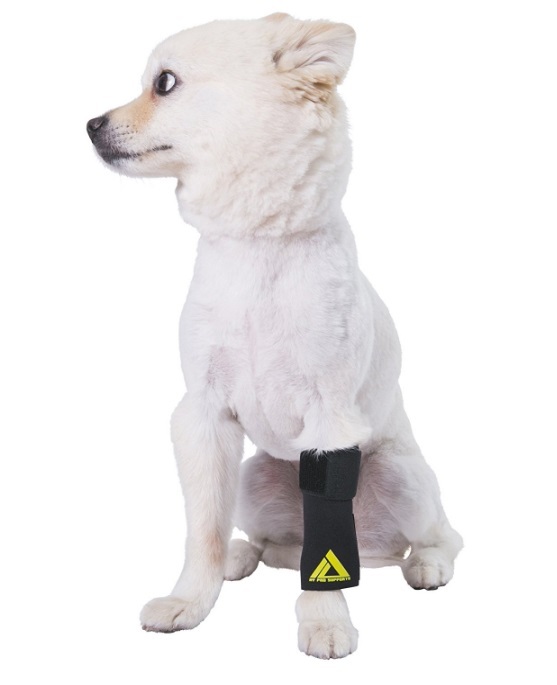 With the KRUUSE Knee Brace, you can help your dog directly with supporting their joint and muscles. This knee brace is also used for rehabilitation to improve movement, in addition to producing stronger muscles in your dog’s legs. 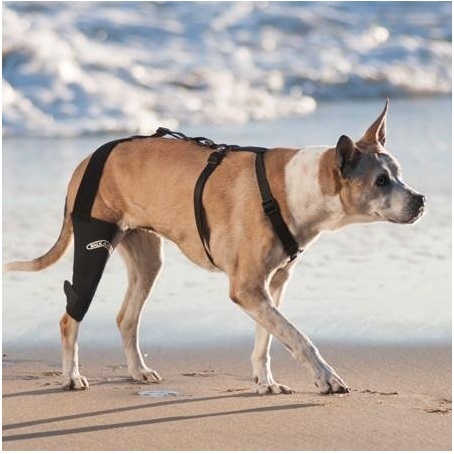 Great choice if you have a dog that likes to take long walks; dogs also show great improvement in their walks when using this particular brace and seems to stay secured to your animal pretty well. May not be ideal for male dogs because of the strap that comes with the brace; the straps are Velcro for security; however the Velcro doesn’t always stay fastened. Some have also said that the material is a bit flimsy and tears in some places. No matter what kind and brand of knee brace you decide to go with, keep in mind that MEASUREMENTS MUST BE TAKEN. No two dogs are the same so use the size chart carefully to find the right size to fit your dog. If your dog is in between sizes go down one size. As with any kind of clothing that we put on our bodies, the sizes can vary depending on the brand so be sure to measure your dog correctly so that you can get as accurate a size as possible.